634717 products found in Kitchen Tools. 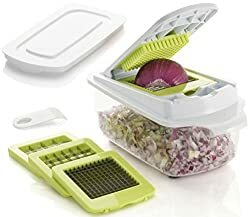 Your request for Kitchen Tools revealed a total of 6634717 results. 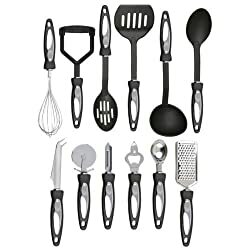 Product Features: Description: 12pc Stainless Steel Cooking Utensil Set With Nylon Handles., Stainless steel and non-stick ergonomic contoured nylon handle grips for comfortable use., Hanging loops for easy storage., Dishwasher safe., Set Includes: 1 x Stainless Steel Tool Spoon, 1 x Slotted Spoon, 1 x Ladle, 1 x Slotted Turner, 1 x Masher, 1 x Whisk, 1 x Cheese Knife, 1 x Pizza Cutter, 1 x Peeler, 1 x Bottle Opener, 1 x Ice Cream Scoop, 1 x Grater., MULTIFUNCTION: Set includes 8 essential kitchen tools and 1 holder for countertop storage and display. You can enjoy cooking feel like a professional chef in kitchen. The set includes tongs, spatula, serving spoon, spaghetti spoon, deep ladle, egg whisk and a strainer. 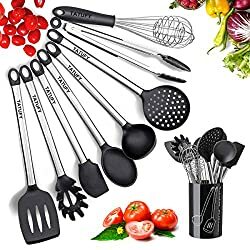 These non stick kitchen utensils meet demand of home cooks and professional chefs.